The Blue Rodeo Channel - 100% Flash website for Blue Rodeo fans consisting of links rated and reviewed by other fans. You can also join and have your say. Livechat coming soon! Blue Rodeo Fan Page By S.A.
Pascale's Haven - has a Blue Rodeo section on her music page. Jam Music: Archive of Blue Rodeo Articles - All of Canoe.ca's Blue Rodeo articles. Blue Rodeo: The Adventure Continues - From Seen Magazine. Two Voices, One Road - From the National Post. All Hail the Queen of Rock TV - From the National Post. Cancon Could Be Victim of Music Mergers - From the National Post. Not Hotter Than July - Review of "The Days In Between" from the National Post. Blue Rodeo, Riding High - Check out the picture that goes with it. From Maclean's Magazine. Now Article - picture scanned from newspaper. In the terrific On A Cold Road: Tales of Adventure in Canadian Rock, by Dave Bidini of The Rheostatics, Blue Rodeo is mentioned on page 157, when the Rheostatics are at a Juno Party. On page 55, Dave mentions that he played hockey with Jim Cuddy. This is also a wonderful book for those who love reading about Canadian music. The book Encyclopedia of Canadian Rock, Pop & Folk Music, by Rick Jackson, has an entry on Blue Rodeo on pages 46 & 47. 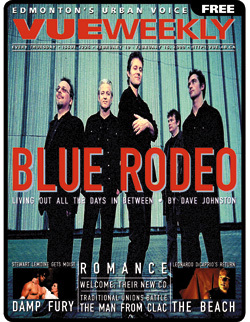 Blue Rodeo is also mentioned in connection with the band Crash Vegas on page 77. There is also a color glossy photo in the photo spreads in the book. Unfortunately, the copy I read only went up to 1994. So to this book, the latest album they've put out is Five Days In July. The book Oh What A Feeling: A Vital History of Canadian Music by Martin Melhuish, mentions Blue Rodeo quite a bit. Check out pages 8, 93, 145, 159-161, 162, 164 (2 entries), 166, 169-170, 173, 181, 184 & 188. The Enclyclopedia of Music In Canada has an entry on Blue Rodeo on page 134. The book was published in 1992, so the entry is out of date. Bob Wiseman is also mentioned under ACCORDIAN, being a player of one in a rock band, page 3. Kim Deschamps is mentioned on page 326 under the COWBOY JUNKIES. It seems he assisted them in concerts and on records with his pedal steel guitar. This was before he was with Blue Rodeo, remember. And finally, Blue Rodeo is mentioned in connection with RECORDED SOUND PRODUCTION. Lots of record labels are mentioned under this heading and Risque Disque is one of them. Risque Disque was distributed through WEA and was a pop label 1985-1990. The roster included Blue Rodeo. The Music Directory Canada, 7th Edition, published by Norris-Whitney Communications Ltd., 1997, mentions Blue Rodeo on pg. 412 under Artist Contacts, and pages 445, 446, 447, 449, 454, 462, 465, 467, 469, 470, 471, 473-477, 479, 480 all in connection with awards they've won. On pages 492-496 Blue Rodeo's albums are mentioned. In Shakin' All Over: The Rock 'N' Roll Years In Canada, compiled and edited by Peter Goddard and Philip Kamin, Blue Rodeo is mentioned on page 204 in the section entitled Viz A Viz Video. According to Paul Martin, Blue Rodeo's video for "Try" was one of the 16 most important videos in Canadian Pop when the book was published, which was 1989. Blue Rodeo is also mentioned on page 40 when Carole Pope talks about the style of Canadian pop. In the book Before the Gold Rush: Flashbacks to the Dawn of Canadian Sound, by Nicholas Jennings, Blue Rodeo is mentioned on pages 4, 5 and 239. Jim Cuddy of Blue Rodeo has a blurb about the book, saying how good it is, on the back cover. This book was published in 1997 by Viking Press. The book Laughing On The Outside: The Life Of John Candy, mentions Blue Rodeo on page 206 when John Candy was emcee at a Benefit Concert at the Skydome. John Candy and Eugene Levy introduced Blue Rodeo, Simon & Garfunkel and Gordon Lightfoot. By Martin Knelman, published by Viking Books in 1996. In the 1990 movie Postcards From the Edge, Blue Rodeo appears at the very end, doing a song with Meryl Streep. She's the one singing, but you can hear Jim and Greg singing background vocals. The credits also list them as Blue Rodeo Band and give all their names. You can also see them behind her when they're performing. Here is a picture of Meryl Streep singing with Bazil Donovan and Greg Keelor behind her.